We’re excited to have Robert J. Lang here to talk about today’s doodle in honor of Akira Yoshizawa. Lang is considered one of the world’s masters of the art of origami. His design techniques are used by origami artists around the world, and he lectures widely on the connections between origami art, science, mathematics and technology. – Ed. Akira Yoshizawa (1911–2005) is widely regarded as the father of the modern origami art form. Over the course of his life, he created tens of thousands of origami works and pioneered many of the artistic techniques used by modern-day origami artists, most notably the technique of wet-folding, which allowed the use of thick papers and created soft curves, gentle shapes and rounded, organic forms. He also developed a notation for origami that has now been the standard for origami instruction for more than 50 years. Yoshizawa took up Japan’s traditional folk art of origami in his 20s, and eventually left his job at a factory to focus full-time on his origami creations. His work came to the attention of the west in 1955, after an exhibition of his works in Amsterdam, and rapidly spread around the world. In his last decades, he received worldwide renown and invitations from all over, culminating in his award in 1983 of the Order of the Rising Sun. While there were other Japanese artists who explored their country’s folk art contemporaneously with Yoshizawa, his work inspired the world through a combination of grace, beauty, variety and clarity of presentation. To him, each figure, even if folded from the same basic plan, was a unique object with a unique character. In 1992, I was invited to address the Nippon Origami Association at their annual meeting in Japan, and my hosts arranged for me to meet the great Yoshizawa at his home and studio. When I was ushered into the inner sanctum, Yoshizawa greeted me, grinning, and then proceeded to show me box after box after drawer of the most extraordinarily folded works I had ever seen. When I was first approached by Google to help create a doodle commemorating Yoshizawa’s work, I jumped at the chance. Google set the parameters of the design: the Google logo, of course, but to be folded with origami and then decorated with examples of Yoshizawa’s designs. I created examples of two logo styles for Google to choose from: one in a classic origami style and a more three-dimensional version based on pleats. Google liked the pleated version, so I set about designing and folding the rest. 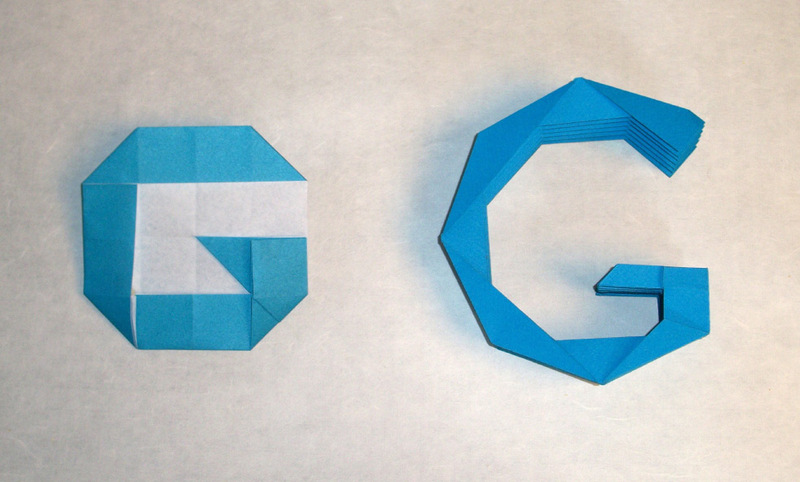 Two versions of the Google “G,” each folded from a single sheet of paper. To design these (or any letterform in this style), one can take a narrow strip of paper, fold it back and forth to trace the outline of the desired letter, unfold it, mark the creases, then arrange multiple copies of the strip pattern on a larger rectangle. The resulting crease pattern is moderately complex, and it gives a lovely 3-D form when folded, but conceptually, it is quite straightforward. If you’d like to try to create your own origami doodle at home, you can download PDFs of the crease patterns for each of the letters. Print them out and fold on the lines: red=valley fold, blue=mountain. The butterflies in the doodle are folded from one of Yoshizawa’s earliest, yet most iconic designs. It is deceptive in its simplicity, but can express great subtlety in its shaping and attitude. The combination of simplicity and depth is part of the essence of origami, and is key to Yoshizawa’s work and legacy. This year marks our 11th annual look back at the searches that compose the year’s Zeitgeist—the spirit of the time. With Zeitgeist, we look at the most popular and the fastest rising terms—the terms with the highest growth in 2011—in many categories across many countries around the world. For our 2011 Zeitgeist site, we’ve improved the visualizations to make it easy to compare terms across categories, added detailed infographics for an immersive dive into the data and created a video overview of the search terms that captivated the world this year. What were they? As it turns out, all around the world, we were excited for the weekend. Web celeb Rebecca Black was the #1 fastest rising query globally, as fans searched for information about the “Friday” singer. She wasn’t the only songstress to capture international attention this year: Adele made the fastest rising lists in over 15 countries spread across five continents, in addition to claiming a spot on our global list. Reality star Ryan Dunn, defendant Casey Anthony and tech luminary Steve Jobs also made our list, as people of interest took five of the top 10 spots. When looking at the data, it is fascinating to see the cultural fads and trends that took over the globe, from cupcakes (making top food lists in over a dozen countries) to the Dukan diet and high-profile weddings, but Google was used for much more than staying up to date on the sisters Middleton and Kardashian. From local celebrities in Finland to Singaporeans looking for news on the revolutions in Egypt and Libya half a world away, people turned to Google to learn more about what was happening on the world stage. It wasn’t just the man-made moments that topped the charts this year, but also the natural disasters that literally shook the world, from Hurricane Irene in the U.S. to the earthquakes in Christchurch and Japan. Terms related to the Japanese earthquake showed up on lists from almost half of the countries included in the 2011 Zeitgeist, including Japan, where 地震 (earthquake) topped the country’s fastest rising list, and our global list, where 東京 電力(TEPCO, owners of the Fukushima Daiichi power plant), became the first non-Latin term to ever make our global fastest-rising list. In addition to news about what had happened, people around the world also looked for ways to give: In the U.S., the top three searches related to charitable giving were about helping Japan. I love search, and to me, it’s exciting to learn more about people in other countries by looking at what they search for—from the most searched for Swiss mountain peaks in Switzerland to soccer terms in Argentina and the stuff of Italian dreams. As the proud owner of a Miniature Schnauzer, I was pleased to see that dogs always beat cats on lists of popular pets, but was surprised to learn that in Russian the most searched for pet was pygmy giraffes (which don’t really exist but are very cute) and in the U.S., sugar gliders made the list. We hope you enjoy learning more about what people around the world and in your country were searching for in 2011. Back in July, we announced our initiative to digitally archive the areas of Northeastern Japan affected by the March 11 earthquake and tsunami. Today, we’re making good on that promise—after driving more than 44,000 kilometers through the affected regions, 360-degree panoramic imagery of those areas is now available through the Street View feature in Google Maps. The images can also be viewed via a special website called “Build the Memory,” where you can easily compare before and after shots of the towns changed by these events. A virtual tour via Street View profoundly illustrates how much these natural disasters have transformed these communities. If you start inland and venture out toward the coast, you’ll see the idyllic countryside change dramatically, becoming cluttered with mountains of rubble and debris as you get closer to the ocean. In the cities, buildings that once stood proud are now empty spaces. In the bottom left corner of each image you’ll also see a month and year that tells you when a particular photograph was taken. When looking at images of the magnificent cities side-by-side with images of the ruins left in their place, this additional context demonstrates how truly life-changing this tragedy has been for those who live there and witnessed the destruction of their homes, neighborhoods and even entire districts. This timestamp feature has been the most requested Street View feature for the last few years, and it is now available on Street View imagery worldwide. Professionals such as historians, architects, city planners and tourism boards—as well as regular users including travelers and home-buyers—can now get a sense of how fresh the online photos are for a locations that interests them. In the case of the post-tsunami imagery of Japan, we hope this particular digital archiving project will be useful to researchers and scientists who study the effects of natural disasters. We also believe that the imagery is a useful tool for anyone around the world who wants to better understand the extent of the damage. Seeing the street-level imagery of the affected areas puts the plight of these communities into perspective and ensures that the memories of the disaster remain relevant and tangible for future generations.